Did the World’s Best Restaurant Just Open in Montecito? If there was any confusion about what to expect during a multicourse meal that costs as much as a plane flight across the country, the first proper dish flickers with gold flakes, as if to reassure that the cost is warranted. Beneath that is a mound of caviar, floating in a transparent gelée of lobster essence, strategically pockmarked with miniscule dollops of hazelnut cream and square nuggets of smoked eel that circle like the hands of a clock. Encasing it all is an iridescent bowl, its color somewhere between silver and platinum, with handcrafted floral flourishes framing those flickering flakes and black fish eggs. But over-the-top opulence is not the only technique on display at The Silver Bough, the eight-seat, $550-per-person culinary experience now served in a hidden corner of the Montecito Inn. The three-plus-hour experience — which involves tastes of nearly two dozen different creations and sips of about a dozen expertly curated beverages — is a culinary lesson of the highest order, featuring techniques both primal and prototypical that are dutifully explained, if you so desire. Yet it’s also like visiting a fine art gallery, in the eye-wowing manner that each dish is presented, complete with custom-made utensils and flatware; like a night at the theater, with storytelling and performance interwoven; like enjoying the ballet, with carefully choreographed kitchen movements and simultaneous server deliveries; and like a hangout with old pals, as the banter is convivial and casual, and diners are encouraged to linger long over post-everything beers and digestifs. And, oh yeah, you eat and drink ’til your stomach and soul are more than content. So Lee, who built his career in the San Fernando Valley and competed in the Top Chef television series, knew what he wanted when signing a lease for the Montecito Inn’s various restaurant spaces in November 2016. “From when we originally took the space, we were all about this concept,” said Lee of The Silver Bough, which started serving on January 31. But The Monarch, a full-service restaurant that consumes the most square footage, started with a bang last August, and the crowds haven’t stopped coming, despite some staff turnover. The Silver Bough — whose eight seats pull up to a Brazilian quartzite countertop with the entire kitchen behind in full view — is carved out of a small corner of The Monarch and was the true centerpiece of the entire Montecito Inn project for Lee, even though it’s just 32 meals a week at max capacity. The limited turnover, in part, explains the $550 price, but it mostly comes down to staff-to-customer ratio, which is essentially one-to-one for a full house, and the quality of the food. 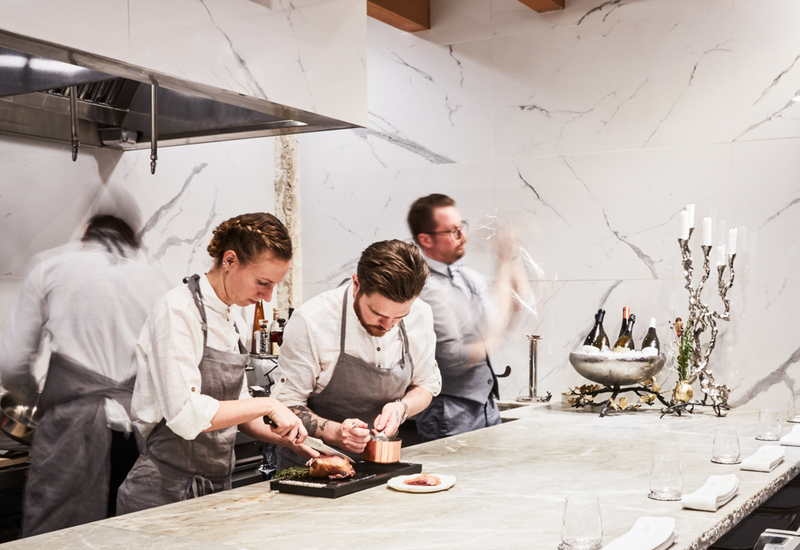 “It allows us to get the best ingredients in the world and run the logistical challenges that come with running an eight-seat restaurant four days a week with only one seating a night,” said Lee. He’s dialing deep into regional purveyors of produce and protein — “We’re staying in Santa Barbara as much as we can,” he explained — but he is also locally resourceful when having to go beyond, such as sourcing Castelvetrano-olive-finished Wagyu beef from Japan through a Santa Barbara–based importer. “We’re trying to find these local connections even in the worldly ingredients,” said Lee. 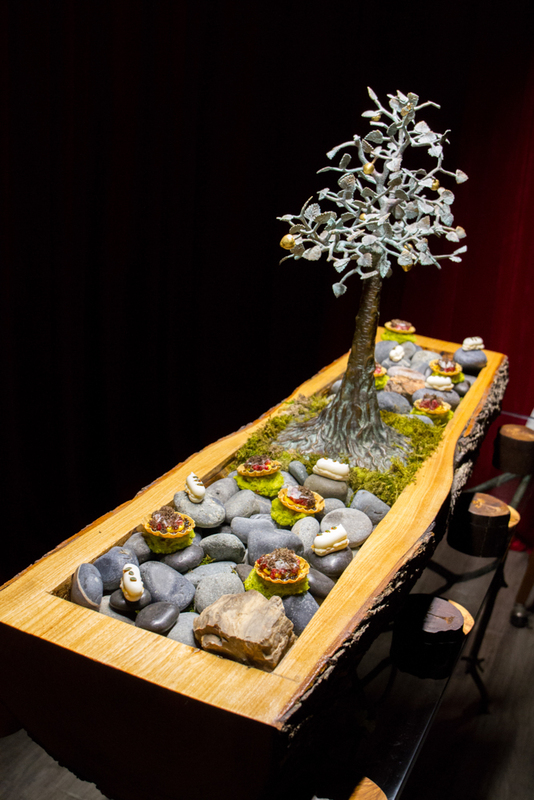 The Silver Bough menu is broken into three acts: Ocean, Land, and Sweets. 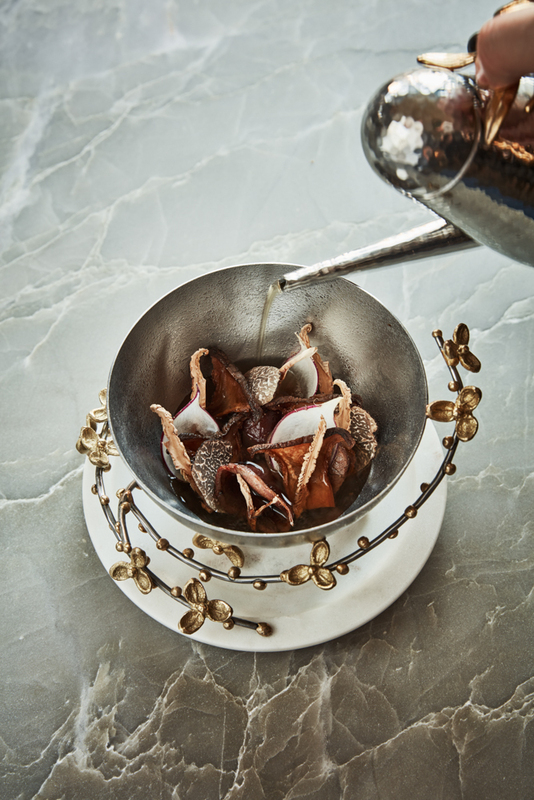 Throughout the savory courses, Lee intentionally breaks the rule laid down by French culinary pioneer Auguste Escoffier of never serving the same primary ingredient twice in a multicourse meal. 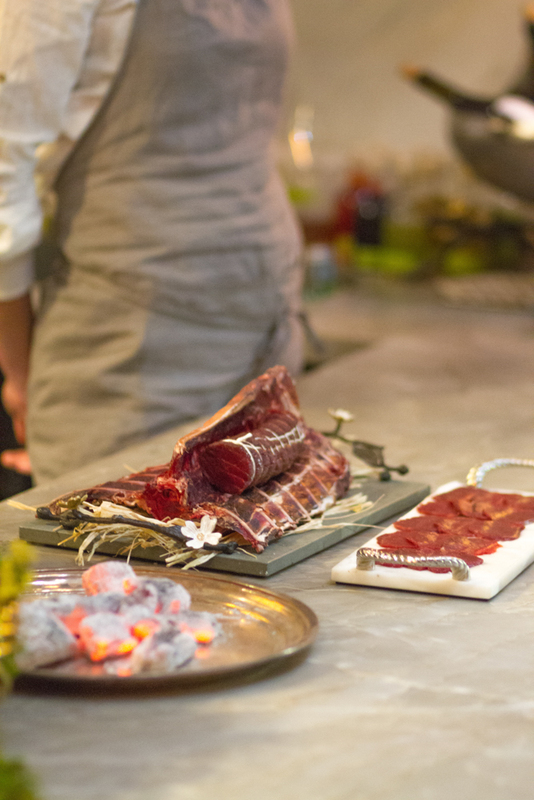 Rather, Lee presents a full set of proteins at the start of each act: baskets full of urchin, lobster, king crab, and golden eye snapper (flown in from Tokyo); heaps of venison, pigeon, duck liver, and that olive-fattened ribeye, alongside red-hot charcoal balancing a simple grill. Then he directs the team in presenting almost all of them in almost every dish, yet each individual incarnation is unidentifiable from the previous — pigeon-bone tea and egg in a venison soup dish, then the same bird’s barbecued breast with pistachio crust in the next, for instance, or lobster tartare set in a green tea/urchin sauce with tomato aspic and carnations, followed by a potato puff filled with lobster innards and topped with bright-orange urchin. The Silver Bough Chef Phillip Frankland Lee (center) prepares one of nearly two dozen dishes with the help of Danielle Van Steen (left) and sommelier Benjamin Schrader (right). 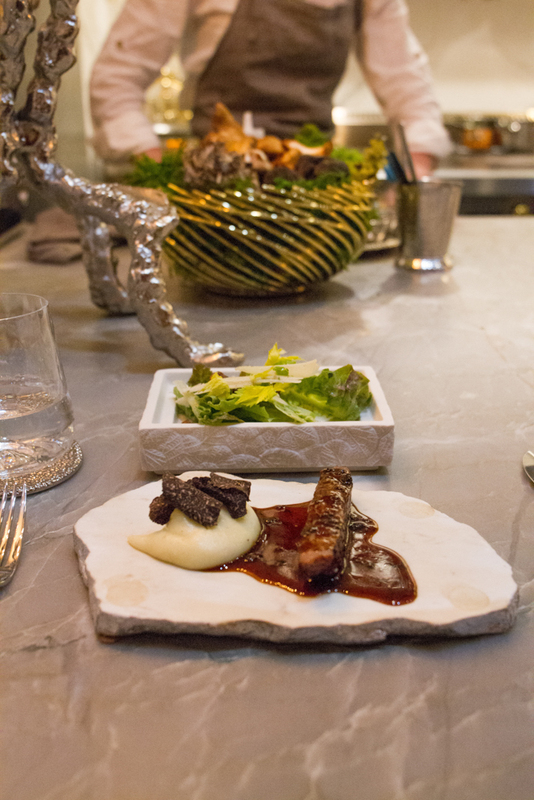 The Land act culminates in the delicately olive-oily Wagyu, first as a rib-eye cap sashimi with soy chicharron, pink pepper skins, and porcini aioli, then as a familiar chunk of steak, with mashed potatoes and ample amounts of shaved truffles. “From the first Scratch Kitchen, we’ve always made it a tradition to end the savories with steak and potatoes,” explained Lee. The Sweets act is the domain of Margarita Kallas-Lee, an actress/model by first career (she was in that Michelob Ultra Super Bowl commercial with robots) who years ago surprised Lee with her pastry prowess. Her creations are revelatory from the use of savory ingredients, like duck-liver mousse with white chocolate, and it’s hard to find verbal descriptions to do them justice. 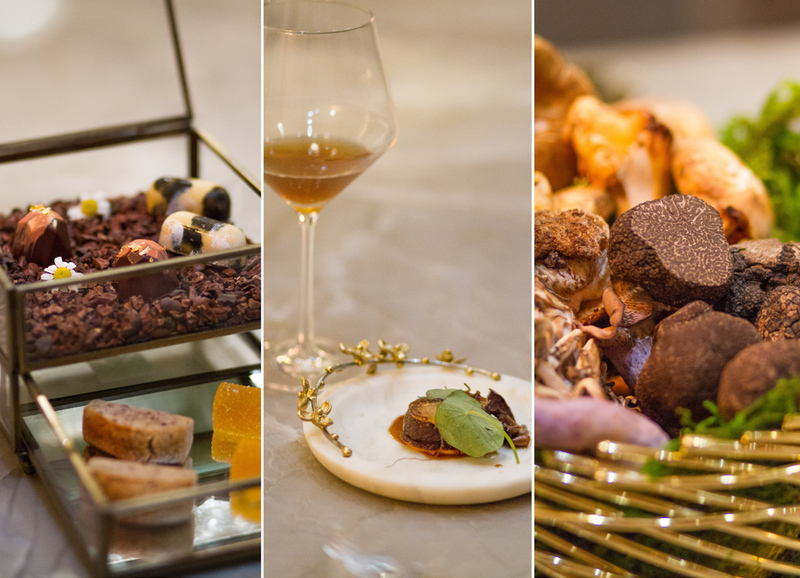 Even your eyes struggle to digest the alchemical desserts, although your taste buds have no trouble relishing in the haute hedonism, an edible encounter somewhere between Willy Wonka and Gustav Klimt. 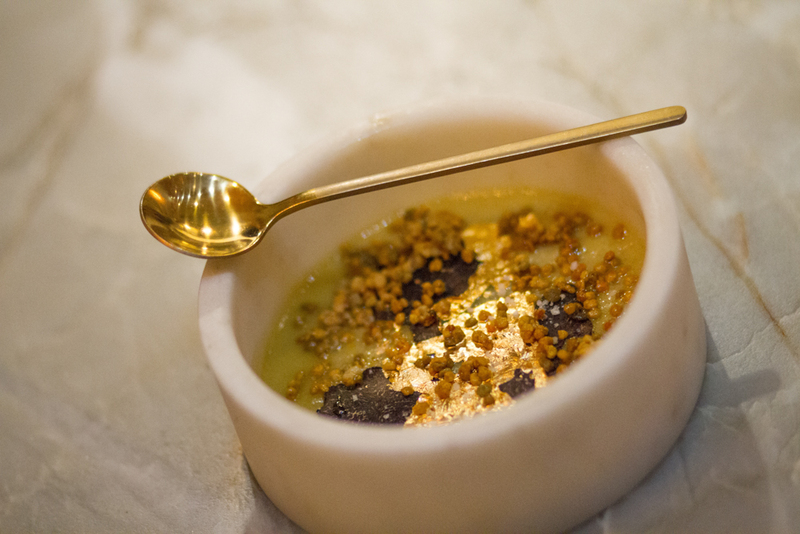 And if that’s not convincing, the final dessert, a chamomile custard with truffles and candied bee pollen, also flickers with 24-karat gold leaves. For me — and I mentioned this to the Lees over complimentary beers and digestifs after the meal, which you are encouraged to enjoy as long as you’d like — the only missing piece was a prominent salad course, something fresh and crunchy and zesty, perhaps between the Ocean and Land courses. Aside from enlivening the palate amid all the savories, it would provide a stage to brightly showcase our farmers as the stars, rather than just as the supporting ensemble. So is this the best restaurant in the world, as my clickbait headline asks? It’s a silly, unanswerable question, entrenched in insurmountable subjectivity, life experience, and personal preference. In recent years, I’ve been lucky enough to eat at some of the world’s top tasting menu restaurants: Pujol in Mexico City, Manresa in Los Gatos, Alter in Miami, and Six Test Kitchen in Arroyo Grande, to name a few. From my admittedly unique experience at The Silver Bough — just two journalists total on their second night of service ever, neither of us having to pay — I can confidently say that what the Lees are doing in Montecito is safely on the same playing field, if not often surpassing the masters. Is it worth $550? Again, another quandary that depends on your income and your interests. But considering that thousands of people spend the same every day for good seats at sporting events, high-profile concerts, and Broadway shows, all of which take about the same amount of time, I’d say the cost is far from outlandish — not only is the entertainment intense, but they feed you too. Indeed, for foodies who dig tweezer food in its most extreme expression, it’s a good investment. Memories are priceless, and it will be a long time before you forget these dishes. Perhaps the real question, with a verifiable answer that we will all discover one day, is, Will The Silver Bough succeed? The Lees are aware that there are not enough wealthy people in the Santa Barbara area to rely on, but they believe that the well-to-do tourists at the Miramar, Biltmore, San Ysidro Ranch, and so forth will help keep things afloat, as will the food tourists who travel from Los Angeles and the Bay Area in search of the next shiny thing. 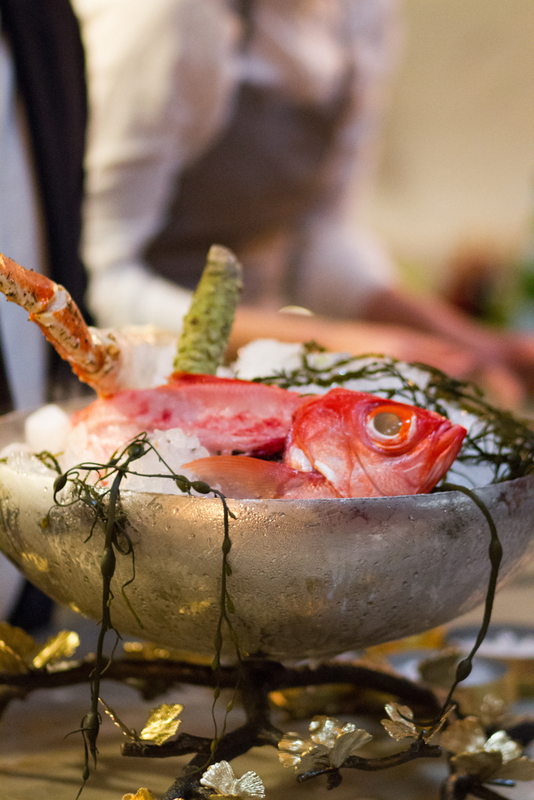 And if they keep the experience as exquisite as it was when I visited, I’m sure the word-of-mouth will lure eaters from all over to see for themselves if the world’s best restaurant calls Montecito home.